Bots are not worms but are the maggot stage of a large fly, the Bot Fly or Gadfly, which is active during the summer months buzzing around horses and ponies at grass and laying eggs on the hairs of the coat. Bot eggs are extremely common around the shoulders, neck and legs of a horse or pony where they appear as tiny yellow, white, or grey specks attached to the hairs. 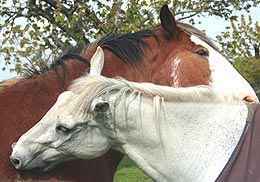 When a horse licks his coat, or a companion's, he will ingest, or swallow, the bot eggs. Once eaten the bot fly eggs hatch and tiny larvae burrow through the soft tissue in the horse's intestinal tract. Eventually the larvae appear as large maggots in the stomach of a horse or pony during the winter months. There may be large groups of these unpleasant parasites fixed to the wall of the horse's stomach where they can cause erosions and ulcers. They can also be a cause of colic. Outward clinical signs can be difficult to pin down, but badly parasitised horses are dull, in poor condition and often lethargic. Bot infestation often occurs in a horse which also has an infestation of other worms lower in his gut. It can be difficult to distinguish which is causing the symptoms in the horse. The main internal medical symptoms resulting from a bot infestation are: Stomach ulcers, peritonitis, colic, blockages in the stomach and, in the early stages, pockets of pus in the mouth of the horse. Treatment must be aimed at removing the bots during the winter before they let go of their hold on the stomach wall and pass down the gut to emerge in the horse's droppings. Dosing a horse with a Bot Wormer in the middle of winter will help to break the life cycle of these parasites. Using equine insect repellant and fly sheets on your horse during the summer may help to reduce the level of bot infestation - but it will be impossible to stop all bot flies. Regular removal and disposal of droppings from the horse's pasture will help to prevent some of the larvae burrowing down into the soil and hatching into bot flies. It can be quite difficult and fiddly to remove bot eggs from a horse or pony's coat. A fine toothed comb can pull the eggs off - you may be able to find a "bot comb"- similar to a cat or dog flea comb or a nit comb - a metal one is best. A specially designed "bot knife" - available from saddlers for use on a horse. A disposable razor or razor blade used very carefully. An old method is to use vinegar to kill the bot eggs. A grooming block made from lava stone can be effective in removing bots. Spraying with Savlon liquid has been reported to make the eggs drop off. You can pick the eggs off the horse or pony with your fingernails - this is very time consuming! Don't leave any eggs underneath your nails to hatch! Some horse owners use sandpaper to remove the bot eggs. Once the eggs have been removed applying baby oil to the horse's coat may prevent new eggs sticking.